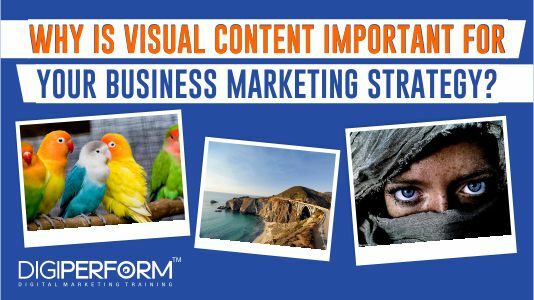 Digiperform > Blog > Business & Digital Marketing Tips > why is visual content important for your business marketing strategy? Whenever we look into social media platforms, we get fascinated by beautiful pictures and graphics. Agree or not? Have you wondered why gifs or memes get more engagement than texts? Even a child gets more attracted to pictures than any commonly written letters. The answer is simple, the human brain is more attracted to Visuals than Texts. What is Visual Marketing? Or What is Visual Content Marketing? The agenda of content marketing strategy is to deliver the message in the best possible but acceptable way. No wonder blogs, podcasts, videos, etc are the most efficient forms of content marketing; however, these forms are also incomplete if they are not clubbed with beautiful images/gifs/graphics. Having a solid visual content marketing strategy will not only enhance the engagement but will also save your time and get better results. What is Visual Marketing aka Visual Content Marketing? It is the form of content marketing which refers to using images, pictures, graphics, infographics, videos, logos, signs, etc. to convey valuable information in an engaging visual format. Rather than sharing your content in the text form, this is the medium to connect with audiences through visuals. 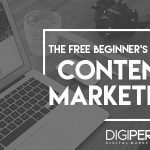 Why Is Visual Content Marketing important? Visuals have the power to attract and retain your audience. They have the power to increase the efficiency of your marketing campaigns. Whether you are following social media marketing campaigns, email campaigns, AdWords, etc; visuals can be very helpful and utilized in any form of marketing strategies. Why are visuals important for blogs? Blogging is the most important form of content strategy for any business. 38% of marketers believe that any marketing strategy is incomplete without blogging. Why? Because it is the ideal way to share information as well as deliver the right message to your audiences about your products & services. However, reading 1000 words doesn’t seem simple and interesting. Readers get bored reading plaintexts. Visuals can play a big role in this. Also, the same study proves that 68% of marketers use blogging for marketing purposes while 74% use visuals as a common type of content. Overall, the content marketing is the only marketing strategy that generates six times higher conversion rates than any other form of marketing. So again the question arises, how visual marketing is important? As we have mentioned earlier, humans are visual beings. As per the researchers, the online reader can only consume 10 to 20% of the information that they read over the internet (unless you have some super abilities like Mike Ross in Suits, which is next to impossible). However, if the same content is clubbed with visual elements, the information can be retained and go up to 65%. That’s why marketers should consider visuals and images in their content strategy and increase the frequency as well than simple blocks or lines of text. Secondly, people on social media are more likely engaging with visual content. In fact, 40% of online users will provide a more favorable response to visual content than plain textual content. Facebook posts with images generate 2.3 times more engagement than posts without them. Visuals play a big role in social media platforms. 94% of social media content generates more views which proves that people love to see visual content more than text ones. Visuals seem both informative and pleasing to the eye. Moreover, social media posts visibility increases by 48% if they contain visuals and videos. Attracting the right kind of attention with your social media marketing is essential for your campaign’s success. By adding visual content to your strategies, you’ll be able to attract the necessary attention required to get your message through to your target audience. High-quality visuals are more prone to gain views which will ultimately result in more shares & comments than a simple text would. Visual-based optimized content gets 37% increase in engagement than normal text content. Furthermore, an engaging visual content is more likely to go viral, meaning that people will share it further with their friends, family and other members of their online community. They can help the audience to better understand the message and appreciate the same as well. For example, you can deeply relate this point with memes. Memes are the highly engaging type of visual content that even used by the businesses to attract audiences. It is the funny but gentle way of humor to spread the message and increase the engagement. The video is one of the most important visual elements used in content marketing today. If we talk about the overall traffic generated through content marketing, 80% of internet traffic will consist of video traffic. 90% of consumers state that watching a product video is very helpful in making a purchasing decision. 64% of consumers are more willing to make a purchase after watching a product video. Moreover, including video as appealing visual content will boost engagement among social followers, it will also boost your sales. The fact of the matter is that Facebook users watch 8 billion videos per day, and a live video turned out to be the most popular format. Infographics take the majority of the complex or complicated information and insights you need to pass on to your audience and package them into a convincing and effectively absorbable picture. To get the most out of an infographic, it’s essential that the outline and design are as powerful as conveying a message. This visual form of content marketing is useful for getting your shoppers to connect with unremarkable insights. Tools like Canva (which is free) and Adobe Photoshop (which isn’t) provides the easiest ways to create your own compelling infographics. Like the one below we have made for our readers, have a look! As we have mentioned earlier in the post, videos are the most convincing form of content marketing that conveys a message to the point and attract the required audiences. A great video demonstrates to your consumers that quality is valuable to you. There are several different types of videos that can help enhance your marketing and business strategy. They could be anything from a how-to or demonstration videos to customer reviews. The important part when choosing which type of video to include is to make sure that it aligns with the overall style of the brand. Adding beautiful images between the texts helps to ensure that the information is read until the end. However, this is only effective if the images are of high quality and add relevancy to the post or page. You can find images from plenty of free sources available on the internet or you can create your own branded images as well. This can be done again in programs like PicMagick or Pixlr, either creating the branded image from scratch or building upon original works. The term ‘meme’ was first instituted by Richard Dawkins in 1976 to describe an idea of the capacity to replicate itself into different meanings from person to person. Memes are now commonly known as images that are accompanied by humorous captions. Not many people have realized that the memes can play a role in content marketing if they are utilized in the right direction. Generally, memes are considered as non-acceptable content created by college goers as the form of entertainment. However, now you can represent an easy-to-create, quirky form of visual content. Creating your own meme is a great way to evoke positive emotions that requires creativity that can set your business apart from your competitors. Firstly, you must determine if memes are appropriate for your niche and whether or not they will gain actual engagement with your audience. If your brand resonates with a younger demographic, then you have your answer! Another unique benefit of memes is that they allow you to create in-jokes about your industry, which is a great way to make people laugh and build a community around your brand. There were days when presentations were only confined to the meeting room. But now you can share your presentation in various forms with the world via sites like SlideShare to expand the reach of your business. A great SlideShare presentation allows you to inform and communicate with your audience, no matter what device they are using. They are quite similar to infographics. Though they have a large focus on attractive design and color, thereby drawing the reader into the text. Thus, if a topic is too lengthy to be appropriate for an infographic, a beautifully crafted presentation can be extremely effective at keeping people engaged with your content. As your presentation is likely to include a lot of information, it’s crucial to remain consistent with things like fonts, borders, and colors. Just like with any form of content, proofreading for spelling and grammar mistakes is paramount. With a screenshot, you can share the actual inner data of the working of your products or services with your audiences. The screenshot can depict the exact data with your marketing copy or testimonial to boost the trust and credibility. Despite seeming like the least awe-inspiring type of visual content in this article, screenshots can be hugely beneficial as a trust-building tool. Consider using them to capture customer reviews or testimonials from industry forums or social media, for example, 88% of people read reviews to determine the quality of a business. Visual content taps into the emotional side of the audience, encouraging them to discover more about your brand. You can generate high-quality visual content which truly resonates with people and promotes it on a regular basis. This is going to be the future. It will be great if you start using right now. 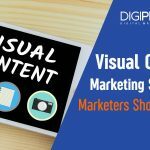 You can also check out Visual Content Marketing Statistics that will definitely make you believe that Visual Marketing is the next generation of marketing.